The tall, slender twin lighthouses on 50-acre Thacher Island, on the Town of Rockport's seal since 1888, are an indespensible part of the local seascape. Now designated a National Historic Landmark, the island is also recognized as a significant historic site for the nation as a whole. European visitors to Thacher Island date back at least to Samuel de Champlain in 1605 and Capt. John Smith in 1614. The island was later named for Anthony Thacher, an Englishman whose vessel, the Watch and Wait, was wrecked in a ferocious storm near the island in 1635 on its way to Marblehead from Ipswich. Thacher and his wife, Elizabeth, were the only survivors of the wreck in which 21 people died. Four of Thacher's children from a previous marriage died in the wreck, and his cousin, Reverend Joseph Avery, died along with his wife and six children. The General Court awarded Anthony Thacher the island "at the head of Cape Ann" to recompense him for his losses, and he originally dubbed the island "Thacher's Woe." The island remained in the Thacher family for 80 years. It eventually was bought back by the Massachusetts colonial government at a cost of 500 pounds for the purpose of establishing a light station. In 1771, there were nine lighthouses in operation in North America. North of Cape Cod there were only three -- at Boston, Plymouth and Portsmouth. All of the lighthouses built to that point by the colonial governments were built to mark the entrances to ports. The twin lighthouses built on Thacher Island in 1771 were the first built to mark a dangerous spot (the Londoner Ledge southeast of Thacher Island) rather than a harbor entrance. They were also the last lighthouses built under British rule in the colonies. The petition asking for the lighthouses on Thacher Island was presented to the General Court by John Hancock, who owned ships on Cape Ann. Dues were collected from local shipping to pay for the lighthouses. Two 45-foot stone towers, about 300 yards apart, were lighted for the first time on December 21, 1771. The towers were erected on a perfect north/south axis, which enabled fishermen to line up the lights to determine true north. The twin lights soon gained the nickname "Ann's Eyes." The first keeper, Capt. James Kirkwood, and his two assistants kept cattle and sheep on the island. Eighteen months after taking the position at Thacher Island, Kirkwood complained that he and his assistants had not been paid. Local Patriots accused Kirkwood of being unpatriotic and eventually he was branded a Tory. In 1775, Minutemen arrived at Thacher Island and removed Kirkwood, who managed to escape to Canada. The lights stayed dark until 1793. Thacher Island was ceded to the federal government in 1790. Joseph Sayward was the keeper in 1793 when the twin lights were finally relighted. The pay for the keepers was $400 yearly, but this was reduced to "266 2/3 dollars" by order of President Washington. This was presumably because Thacher Island was thought to be an advantageous place to live, with cattle and a vegetable garden to provide food. Because the lights at Thacher Island were the first to be seen by many travelers coming from Europe into Massachusetts Bay, it was considered a very important station by the government. In 1810, the south tower became the scene of a test of new lighting apparatus designed by Winslow Lewis of Boston -- a system of multiple Argand oil lamps and parabolic reflectors. Henry Dearborn, the local lighthouse superintendent, observed the twin lights from a distance and pronounced the new light to be like "a brilliant star" in comparison to the old light one in the north tower. In 1812, Lewis was contracted to outfit all American lighthouses with his apparatus. A new one-story brick dwelling was built by Winslow Lewis on Thacher Island in 1816, at a cost of $1,415. This house still stands with many modifications, including the addition of a second story. Winslow Lewis returned to Thacher Island in 1841 when he repaired and refitted the lanterns on both towers. New lamps and reflectors were installed in each lighthouse. Charles Wheeler became keeper in 1837 at a yearly salary of $450. Wheeler invented, patented, and put in service a new lighthouse lamp that kept oil from solidifying in the winter. Wheeler made many improvements, including clearing land, building a fence, and planting apple and pear trees and grape vines. He also aided the survivors of shipwrecks several times. Engineer I.W.P. Lewis called a new two-story wooden dwelling built in 1840 "the best house in the district" in his 1843 report to Congress. Keeper Wheeler used the old "stone house" as a schoolroom and storehouse. A tremendous storm hit the area in October 1841. The glass in the lanterns of both towers was loosened, and some of it was broken by the storm. According to I. W. P. Lewis, only the fast action of Keeper Wheeler saved both lanterns from total destruction. Wheeler used pieces of lead to reinforce the panes of glass, and he later "puttied the whole very carefully" to stop leaks. Wheeler was removed as keeper for political reasons in 1849. A few months later he headed to California during the Gold Rush. In 1853, an agent of the Portland Steam Packet Company complained of the lack of a fog bell at Thacher Island, and one was quickly installed. That same year, Keeper Lancelot Kelly Rowe's wife Nancy gave birth to a baby daughter, christened Belle Thacher Rowe. 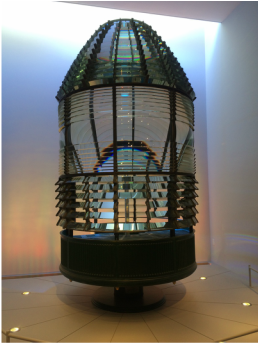 During the 1850s most of America's lighthouses received Fresnel lenses that improved their efficiency tremendously. By 1859, Thacher Island and Cape Canaveral, Florida, were the only American lights that hadn't received the new lenses. It was decided that new, taller towers were needed at Thacher Island. Twin towers, 124 feet high, were built in 1861. New Hampshire granite was used instead of local Cape Ann granite, which drew much criticism from locals. A new wood-frame keeper's dwelling was built near the north tower. The twin lighthouses were fitted with enormous first-order Fresnel lenses, which cost $10,000 each. The new towers were first illuminated on October 1, 1861. James Collins Parsons was keeper during the construction of the new towers, and Albert Giddings Hale took over in 1861. Hale had recently been ill with typhoid fever, and his doctor advised him that the life of a lighthouse keeper would speed his recovery. He may have recovered from his illness, but taking part in the rescue of shipwreck victims on multiple occasions probably sapped Hale's strength. The Hales left Thacher Island in 1864, and Alexander Bray became the new principal keeper. Bray -- a Civil War veteran -- and his wife, Maria (Herrick), were both descended from old Gloucester families. Bray had been an assistant keeper since 1861, and it was reported that he was the first man to the light the new lens in the south tower. On December 21, 1864, one of the assistant keepers fell ill with a fever. Keeper Bray and another assistant left for the mainland to take the ailing man to a doctor. Maria was left in charge of the station. The only person with her was her 14-year-old nephew, Sidney Haskell. A heavy snowstorm blew in later that day, making it impossible for Alexander Bray to return to the island. Maria Bray and Sidney Haskell braved the high winds and heavy snow to light the lamps in both towers. Each tower had 148 steps to the top, and Maria had to repeat the trip three times that night to keep the lamps supplied with oil and the lantern room panes free of soot. A second night passed before Alexander Bray could return to the island, and not once did Maria allow either light to go out. It was a happy Christmas as the Brays were reunited. The Brays left the island in 1869. The light-keeper's residence is a comfortable modern brick building of two stories. There is, or rather was, at the time of the writer's visit to the island, an old stone house standing there that was reputed to be of great age. The two light-towers, built of uncut granite, are each one hundred and fifty feet high, and they are furnished with lenses in which a dozen persons might stand erect without inconvenience. The keepers have all followed the sea. Only sailors are capable of appreciating the responsibility that the station imposes. One of the keepers said to me—and habitual care is stamped upon the faces of these men — "We know how eyes may be strained in thick weather at sea to get hold of the light; and that makes us painfully anxious to keep it up to its full power, especially when frosts or sea-scud dims the lantern; for that is the very time when minutes count for hours on board ship." Weather has always been a prominent factor in life at Thacher Island. On October 20, 1891, an assistant keeper named John Farley lost his life as he attempted to land at the boatslip in heavy seas. One of the worst storms in New England coastal history struck in November 1898. The most famous casualty of the storm was the steamer Portland, lost with about 200 people on board. An assistant keeper at Thacher Island, Albert Whitten, may have been the last person to see the sidewheeler as it was foundering far out in Massachusetts Bay. Despite the lights on Thacher Island, many wrecks still occurred in the vicinity. In 1876 a freighter carrying 800 tons of coal struck a submerged wreck in a storm. The citizens of Cape Ann saved on their fuel bills that year, as they salvaged 500 tons of coal from the ship. The still-standing wood frame principal keeper's house near the south tower was built in 1876. In the late 1800s a railroad was installed, and it was gradually extended until by 1900 it was over 500 feet. This railroad was used to bring fuel and supplies to the various buildings. In the name of national defense a telephone line was installed in 1902, connecting Thacher Island to the mainland at Rockport. Several children were born at Thacher Island over the years. One of them, Thatcher Warren Kezer, was born in 1901. He later claimed that his father, Assistant Keeper George Kezer, took so long trying to fetch the doctor to the island for his birth, by the time they returned little Thatcher was waving to them from the boat ramp. Right: Assistant Keeper George Kezer with two of his children at Thacher Island. Courtesy of Barbara Kezer. There were seven children living at Thacher in the early 1900s. The state refused to build a school on the island, but they finally agreed to pay a teacher to live there. The teacher, a young woman, didn't stay at the island very long. She met and subsequently married Edwin Tarr, son of the keeper and an assistant keeper himself. The couple moved to Boston where Edwin served as keeper of the Long Island Head Lighthouse. After that, most of the children boarded on the mainland during the week so they could attend school. In 1919, President Woodrow Wilson was returning from Europe on board the U.S.S. George Washington when the ship ran into thick fog near Thacher Island. The fog signal was sounding, but the ship kept heading straight for the island. At the last minute, Third Assistant Keeper Maurice Babcock, who later became the last civilian keeper of Boston Light, put the foghorn in manual and sounded it over and over until the captain steered away from the ledges. Fog is by no means uncommon in the area. During a particularly bad stretch of fog in July 1959, the fog horn at Thacher Island sounded for 211 consecutive hours, or a total of 38,145 uninterrupted blasts. The government first proposed the discontinuance of the north light in 1912. The Boston Transcript published an editorial condemning the idea, and many Gloucester fishermen protested the change. These complaints put off the inevitable for another 20 years, but in 1932 the north light was extinguished. A submarine cable that had been laid in 1902 provided power for the south light, which was intensified to 70,000 candlepower. On May 3, 1932 it was reported that the master of the steamship Falmouth saw the newly intensified south light from a distance of 44 miles, an unusually high distance for any lighthouse. John (Jack) Michael Schmutz was a radio operator on Thacher Island 1933-35. Courtesy of Fred Little. 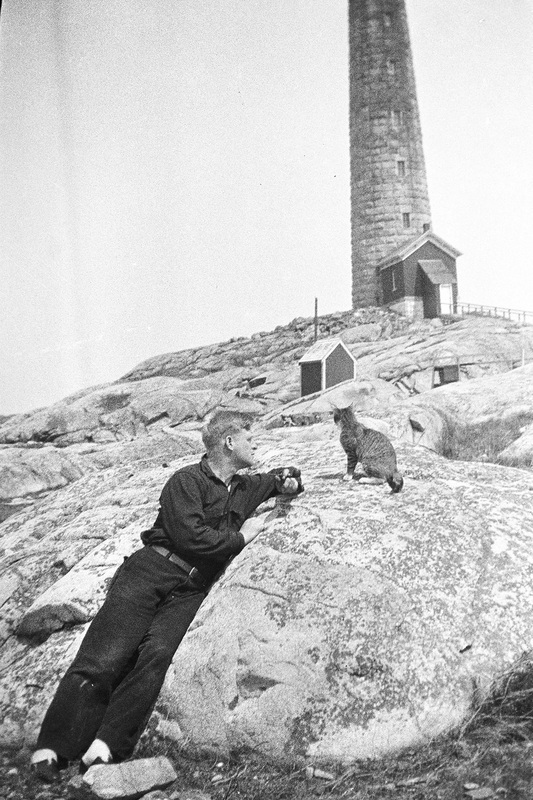 Unidentified Thacher island resident circa 1930s, courtesy of Fred Little. 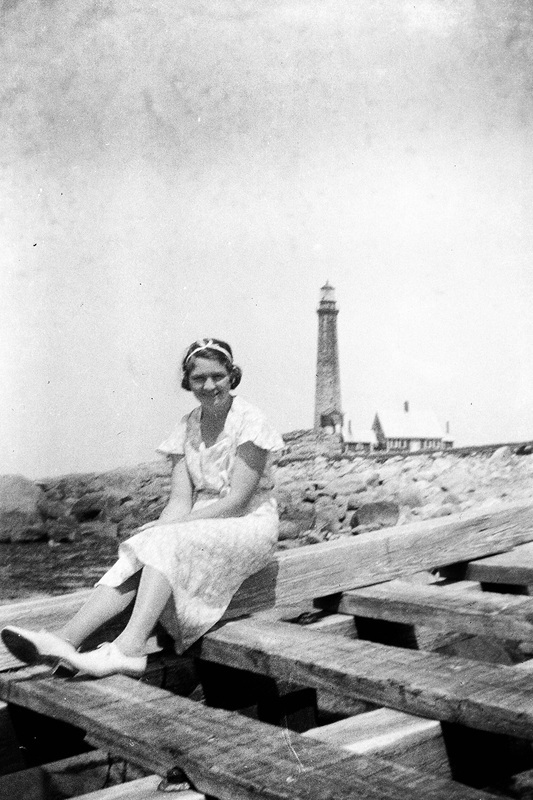 A relative of Jack Schmutz visiting Thacher Island in 1934. Courtesy of Fred Little. Thacher Island had been the last twin light station on the coast. There were at one time seven twin light stations and one triple light station, all on the Atlantic coast. Selectman Ernie Poole said, "Putting out the north light is like putting out the lights in the White House." A newspaper reported that "these luminous twins hold a firm place in the hearts of all who know them." In 1948, after the Coast Guard had taken over at Thacher Island, a crew came out to demolish an old Navy watch station on the island. They left after burning the structure down, but smoldering embers started a fire that quickly spread. The families feared that the fire would reach the fog signal station, where it could ignite an explosion because of the compressed steam. A squad of firemen and Coast Guard from the mainland were needed to help extinguish the flames, and disaster was narrowly averted. In 1967 federal officers brought Joseph "The Baron" Barboza, who had testified against organized crime figures, to Thacher Island for safe keeping. Barboza complained of the primitive living conditions on the island. The secret of his whereabouts was soon out, so he was moved to a rented estate on Gloucester's Eastern Point. He was eventually relocated to California under the witness protection program. One Coast Guardsman later reported that "he was a heck of a nice guy." A 1969 article described life for the Coast Guard keepers at Thacher Island. Seaman James Davis, a 20-year-old native of Rhode Island, lived on the island with one other Coast Guardsman for two weeks followed by a week at home in Gloucester with his wife and infant son. The other Coast Guardsman at that time was 19-year-old Engineman Second Class John Wigger of South Carolina. Their only company consisted of three dogs -- black mongrel Rastus, collie Angel, and German shepherd Duchess -- and two cats, Pat and Mike. Mike surprised everyone by giving birth to five kittens. Left: One of the island dogs, Rastus, lived to the ripe old age of 18 and is buried near the assistant keeper's dwelling. The south light and the fog signal were automated in 1980, and the Coast Guard moved off the island. The first-order Fresnel lens was removed from the south tower; it's now on display at the Cape Ann Museum in Gloucester. Ned Cameron and other concerned citizens of Cape Ann formed the Thacher Island Association and chose a caretaker to live on the island. The first man chosen for the job was Russell Grubb, a retired bank employee. Grubb eventually assembled a menagerie of sheep, goats, a dog and a cat to keep him company. He self-published a book, Thacher Island: An Adventure. One must imagine being here with me on a typically beautiful day, with the contrasting blues of sky and sea combining with the multi-colors of the flowering bushes, poison ivy leaves and all the other blossoming plant life which abounds in all directions. Right: Entryway in the south tower. In this 1989 video clip, Ned Cameron talks about why he helped found the Thacher Island Association. Thacher Island caretaker Armand Desharnais in 1989. 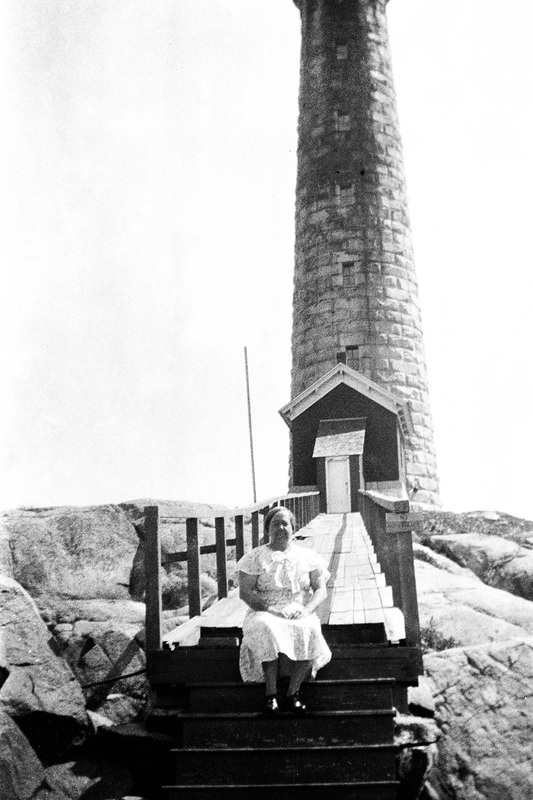 Thacher Island caretaker Betty Desharnais in 1989. After three years on the island (he returned a couple of years later for two more years on the island), Grubb gave way to a succession of other resident caretakers. George and Dottie Carroll had a six-year stint as caretakers. "I always wanted to live on a farm by the sea," said Dottie Carroll, "but I never expected to." In 1989 the north light was restored and opened to visitors, offering a panoramic view of the area. The north light has since been relighted as a private aid to navigation. Its amber light once again makes Thacher Island the only operating twin light station in the United States. Above, a sign in the north tower. Right, the modern optic in the north tower. The landing ramp on the island was damaged in 1992, and the island went without tourists for a year as repairs took until 1994 to complete. In the harsh winter of 1995, the boat ramp was completely washed out. In 1998, United States Representative John F. Tierney secured $250,000 for a new boat ramp as part of a spending bill passed by Congress. This funding, combined with money raised by the Thacher Island Asociation and the Rockport Town Committee's revenue sharing funds, meant that a new ramp could be built. Work on the 120-foot ramp was completed in the fall of 2000. Left: A Coast Guard Aids to Navigation team member works on the lighting apparatus in the south tower. In the spring of 2000 a new Coast Guard Keeper Class buoy tender was launched, the Maria Bray, named for the heroic wife of Civil War-era keeper Alexander Bray. On its way to its homeport in Mayport, Florida, the vessel stopped for a ceremony near Thacher Island. Members of the Thacher Island Association were on board as Commander David Foley told the incredible tale of how Maria Bray kept the lights going through the winter storm in 1864. A wreath was placed in the ocean in her honor. On January 3, 2001, Interior Secretary Bruce Babbitt designated Cape Ann Light Station on Thacher Island a National Historic Landmark, making it the ninth lighthouse station, and one of less than 2,500 sites nationwide, to receive this designation. Paul St. Germain, President of the Thacher Island Association, said "This is a great honor for Rockport and an opportunity for us to attract private and public grants for our ongoing preservation efforts for this historic site." Above, left and right: Video taken during the renovation of the assistant keeper's dwelling in May 2002. The assistant keeper's dwelling under renovation in May 2002. Right: The first-order Fresnel lens from the south tower, now on display at the Cape Ann Museum in Gloucester. The Town of Rockport's Thacher Island Committee in partnership with the Thacher Island Association maintains and operates the island, including both lighthouse towers. The Coast Guard continues to maintain the solar-powered light in the south tower. In May 2002, the Campbell Construction Group was contracted to replace the roof and repaint the assistant keeper's dwelling. Repair work also included replacing rotted wooden components of the building, and repointing of brickwork and chimneys. The restoration of the principal keeper's house was completed in 2007. For more information or to join the Thacher Island Association, contact the Thacher Island Association.